Many of us yearn for the “good old days,” but that time is now in the sport of musky fishing. Stocking has expanded the fish’s range, and catch-and-release is widely accepted by musky anglers. Thanks to these positive factors, it’s very likely there are more 50-inch and better muskies now than ever before. But recently, state budget crunches and fears of spreading fish diseases have forced natural resources agencies to re-examine their stocking plans. Natural reproduction may be relied upon even more in the future to sustain musky populations. Thus, catch-and-release will not only be necessary for bigger fish but to maintain the fishery as a whole. A giant net is essential to the proper catch and release of big muskies like this one. If muskies are released in an efficient manner, a very high percentage of them will survive the process. Every year stories are told of fish being caught and released multiple times, sometimes even within days of the first capture. In the interest of better musky fishing, let’s look at the right way to release a musky. First and foremost, properly releasing muskies requires the right tools. Most musky anglers have thousands of dollars invested in their tackle, so spending a couple hundred dollars for the betterment of the fishery shouldn’t require a second thought. The most expensive of this equipment is a good net, one with a big hoop to quickly net a musky and a deep bag to use as an “in-the-water livewell” to hold a fish. Nets designed for muskies have rubber-coated bags, which minimize a netted fish’s mucous (slime) loss, while at the same time maintain rigidity so that a hooked musky that rolls won’t create a hopeless tangle of net, hooks and fish. Other tools an angler should have are a long-nose pliers for removing hooks (mine measures 16 inches in length), a mini bolt-cutter for cutting large hooks, a side-cutter for smaller hooks, jaw spreaders, a split ring pliers for replacing cut hooks, extra hooks, and a hook file for sharpening replaced hooks. A boater’s dry box for storing the tools is handy. Speaking of hands, some kind of gloves to protect your fingers from a muskie’s gill rakers and teeth, and your lure’s hooks, is a smart investment. If you hook a smaller musky and don’t want photos, you don’t need to net it. Just reach down with the pliers and grab the back of the hook, and lift. The weight of the fish will usually cause it to fall back into the water, unhooked quickly and easily. With a bigger fish, I recommend netting it at the first opportunity. Not only will you end up catching more muskies, but the longer you fight a fish the less its chance of survival. Take the musky head-first and swing through with the net as your partner (the lucky guy who hooked the fish) leads it toward you. Don’t stop swinging with the net until the fish is completely in the bag. Now, rather than bringing the fish into the boat, simply leave it in the water and lay your net’s rim on the gunnel. The fish must remain in its environment. I always tangle a few loops of the net bag in a boat cleat to keep my net from sliding into the water should the fish thrash. When reviewing my fish photos, I sometimes see my net hanging at a funny angle, with only this net-tangling precaution keeping it from going to the bottom. Now, assess how the musky is hooked. Can the hooks be easily removed with the pliers? If so, the musky can be unhooked in a similar manner as you would with a smaller, unnetted fish. If more than one point of a treble hook is buried you may need to cut one of the hooks to get the lure off the fish’s face. A deeply-hooked fish may require use of the jaw spreaders, and with 16-inch pliers you should be able to reach even the deepest of hooks. Once the musky is unhooked, leave it in the net and in the water. Untangle the lure from the netting and set it aside where it won’t be in the way. In the meantime, your buddy should be preparing the camera. Once the camera is ready, quickly grab the fish and hold it horizontally for a couple quick photos. The best way to hold a musky is with what is known as the “Leech Lake Lip Lock.” To do this, slide your hand between the gill cover and gills of the musky up to the notch where they come together. Then, pinch tightly against the skin between your thumb and fingers, and lift. Don’t let go of this grip even if the fish thrashes. As the fish comes up out of the water, quickly slide your free hand under its belly for support. The best photos are always taken with the sun at the photographer’s back, so you may need to reposition your boat before lifting the fish from the water. Use the camera’s flash to prevent shadows, fill the frame with the lucky angler and his musky, and squeeze the shutter. Three or four photos are all you need. Then, lift the fish over the gunwale and place it in the water. There is no need to rock the fish back and forth; simply hold it by the base of the tail in an upright position and eventually you will feel its strength come back. When the fish is ready to go, release the tail and let it swim away. If you want a fish for the wall, consider hiring a taxidermist who specializes in replicas. In this manner, you can have your musky and release it, too. 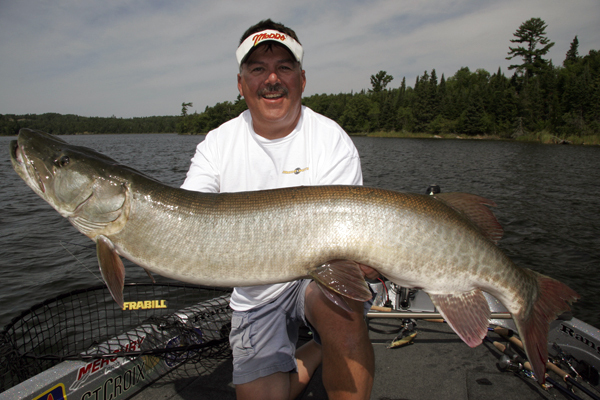 If you like catching big muskies, you owe it to yourself and the fishery to make every effort to release muskies right. With the right gear and technique, anyone can release a musky like a pro.